My daughter after meeting one of my favorite authors. Back in November, the main children’s library in the city of Charlotte, ImaginOn, put together a free literary festival for families, children and teens. One of the highlights of the festival was an impressive lineup of visiting children’s authors from a variety of genres. When I saw that Lauren Oliver was scheduled to appear, I slyly asked my daughter if she wanted to go to the festival. (I’ve reviewed several of her books on my blog.) 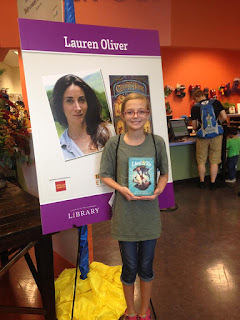 Because she’s a very wise 12-year-old, and knows how much I love to read and write children’s fiction, she said, “Sure!” We hopped in the car and got to the event just in time to check out Oliver’s appearance in one of the auditoriums. She was a great speaker, and although her talk was targeted at encouraging kids to write, I also got a lot out of it. A willingness to write. A lot. This seems simple, but it’s one of the main points Oliver emphasized in her talk. Before she got her first book published, she wrote several other manuscripts, over and over, and even thought she went on to get an MFA, she stressed that “you don’t need a fancy education to be a writer.” The best way to learn is to keep writing, through the good and the bad, as your mastery of the craft will come with time. Ideas for stories (or articles/essays, if you’re also a freelance writer). If you’re like me, you’re plagued by what can feel like too many ideas. Not so, according to Oliver. She writes in a variety of genres and categories (contemporary and fantasy young adult, middle grade, adult, etc.) Unbeknownst to me, she also writes under a pen name. I have no idea what those genres are, or what her pen name is, but it shows me that if you can execute your ideas, you can be a prolific writer. A writing style that works for you. Oliver shared that when she’s writing first drafts, she dashes off ideas quickly and doesn’t even spell out characters names. “A. jumped off the cliff and into the waterfall . . .” She also can’t revise two YA novels at the same time, but has to mix up categories. Elin Hilderbrand and Kristin Hannah both write their first drafts longhand. Whatever writing method helps you produce work consistently, keep at it. Ingenuity. Because Oliver is also an entrepreneur, she co-founded a literary development company called Paper Lantern Lit. 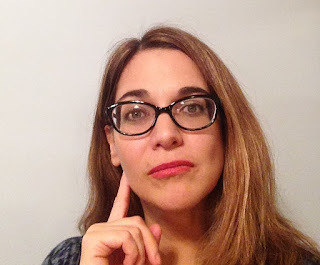 She and partner Lexa Hillyer craft ideas for story narratives and then search for writers who can help bring their stories to life. It just goes to reinforce the fact that possibilities are limitless for writers. Feeling inspired yet? What traits do you feel are necessary for writers? Please share your thoughts in the comments below. Renee Roberson is an award-winning writer and editor who reads more children’s fiction than adult fiction these days, mostly in the name of research. Visit her blog at Renee's Pages. Renee--I wish I was--like you--plagued by too many ideas. What a wonderful "problem" to have. I've found what works for me, but continue to fine-tune my style/protocol/routine/rut. I hope 2016 is the best year ever (so far) for you--writing-wise and otherwise. To be a writer, you have to persevere--through the dry periods, the bad writing days, the too-soon deadlines that come up in the middle of everything else that life throws at you. You have to believe in yourself and yet you have to be willing to listen to those who have more experience because writing is constant learning.